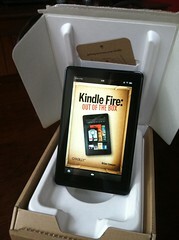 Since the Kindle Fire was released, critics piled up about the performance of the UI and the overall feeling while using the device. It seem less responsive than many thought, and despite it's essentially an eBook-reader expect full tablet superpowers. Now Amazon seems to address this issues and promising an update coming soon for the Fire. That sound like a good idea. Users apparently buy it as an tablet rather than an ereader, which isn't surprising. The New York Times writes that not only performance problems will be solved, but also glitches in the multitouch navigation. Further, an edit option for the list of recent documents or visits will be added. Analysts keeps on their high number prediction of selling devices and Amazon itself said it was it's most successful product release ever.